After completing a Degree in Literature at Université du Québec À Montréal, and a College Diploma in Music and Humanities, Isabelle trained for many years in dance improvisation, Contact Improvisation, release technique, somatics, physical theater, butoh, performance art and acrobatic stilts. .
Over the last years, Isabelle created original interdisciplinary performance work and collaborated with artists Emmalena Fredriksson, Emilio Rojas, Willoughby Arevalo, Lea Kieffer and Trinidad Martinez, amongst others. She has been an active member of The Carpetbag Brigade Physical Theatre (San Francisco), best known for its cutting-edge acrobatic stilts drama, as well as collaborating with Theatre Junction, a multi-disciplinary company based in Calgary and Body Research, a company crossing the boundaries between theatre, dance, and self-exploration, using the study of Contact Improvisation as one of its main tools. 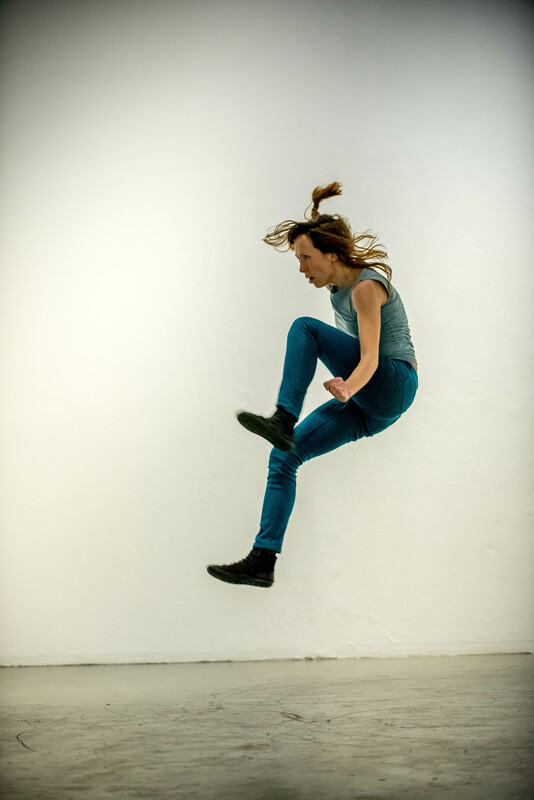 Isabelle is a choreographer and acrobatic stilt/physical theater instructor for the Still Moon Performance Arts Festival (Vancouver) and teaches Contact Improvisation and acrobatic stilts to artists and community members here and abroad. She has been the artistic director of the Elsewhere CIDI Festival and performed and taught at numerous international festivals, including the Fuertevetura Contact Improvisation Festival (Canary Islands), Inesperadamente International Dance Encounter (Spain), Israeli Contact Improvisation Festival (Israel), Symposium Imagining Bodies (Estonia), Montreal International Jazz Fetsival (Canada), International Forum of the Cultures (Mexico), Edinburgh Fringe Festival (Scotland), etc. Her work has been supported by Canada Arts Council, Conseil des Arts et des Lettres du Québec, Offices Internationaux de la Jeunesse du Québec, Fonds de soutien aux initiatives de création et de diffusion professionnelles de la MRC d’Arthabaska, Simon Fraser University Fellowships and Awards and the Elsie Jang Award. Believing in cultural exchange and art as political action, Isabelle has been teaching dance and movement classes to women’s groups in Palestine, conducted research on the coexistence of contemporary and traditional dance performances with local artists, thinkers, dancers and choreographers in West Africa. She also facilitated the artistic residency “Nowhere/Now Here”, about issues of home and migration at El Quirofano, in Murcia (Spain), in collaboration with Trinidad Martinez and 25 local dancers, and the artistic residency “Abris/Débris”, at the French Institut in Marrakesh, Morocco, in collaboration with Willoughby Arevalo and 8 local dancers & musicians. Isabelle also danced in the work of Superamas (France-Austria), Felix Ruckert (Germany), Flam Chen Pyrotechnic Theater, La Belle Zanka (France), as well as collaborated with Nemcatacoa Teatro (Colombia), Eman Haram (Geography of Elsewhere, Montreal), the experimental film artists Daïchi Saito and Karl Lemieux (Double Negative Collective, Montréal), and the experimental music group Medecine Baul (Arcata). She plays classical guitar, diatonic accordion and other unclassified sound devices.